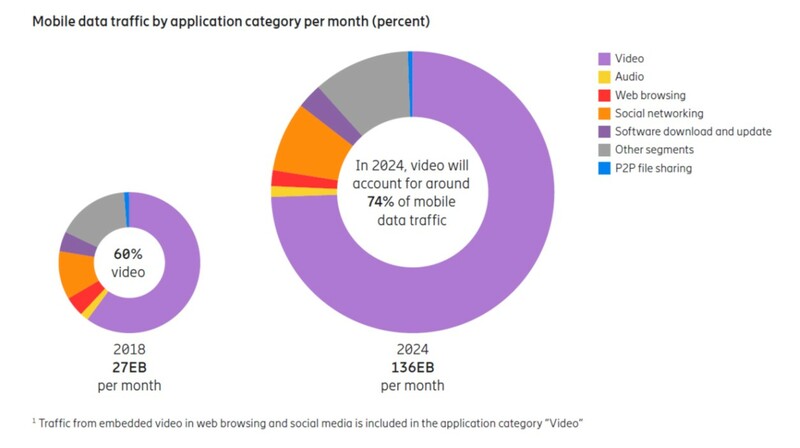 With this year’s edition, Ericsson extended its predictions about the mobile industry to 2024. While the total number of mobile subscriptions (SIM cards) is forecast to reach nearly 9 billion, there will be 6.2 billion people, or “unique subscribers”, using mobile communications by that time. Ericsson also expected 5G networks to cover 40% of the world’s population by 2024, with 1.5 billion subscriptions on the latest 5G mobile broadband service. This will be led by North America, where 55% of all mobile subscription will be on 5G by that time. “As 5G now hits the market, its coverage build-out and uptake in subscriptions are projected to be faster than for previous generations,” said Fredrik Jejdling, Ericsson’s Executive Vice President and Head of Business Area Networks. In total, Ericsson estimated 95% of all subscriptions will be on mobile broadband (3G and later). These numbers also largely dovetail with what GSMA handed out recently, which forecast 6 billion mobile internet users by 2025, by which time 40% of the world’s population will be on 5G. 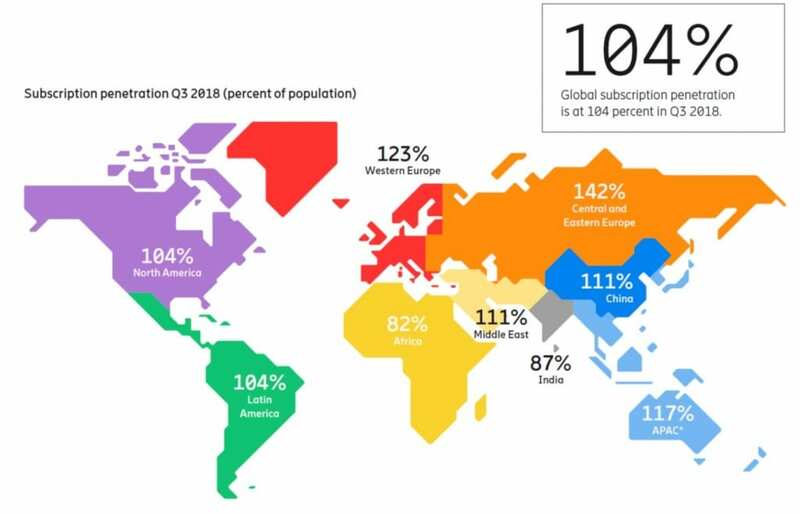 Looking at the current status, Ericsson data showed the world’s mobile subscription reached 104% of the world’s total population, with Central and Eastern Europe the highest penetrated region at 142%. The number of SIM cards exceeds the total population largely because of “inactive subscriptions, multiple device ownership or optimization of subscriptions for different types of calls”, explained Ericsson. Q3 of this year also saw mobile data traffic grow by 79% year-on-year, the fastest growth since 2013. The total volume of mobile data reached 27 exabytes (EB), 90% of which is being generated by smartphones. Although North America consumers still use the largest amount of data, 8.6 GB per smartphone per month, or equivalent to “streaming HD video for over 12 hours monthly”, the fastest increase in data use came from North East Asia, most notably China. Users in this region see 7.3 GB data going through every smartphone every month, or equivalent to “streaming HD video for around 10 hours per month”. 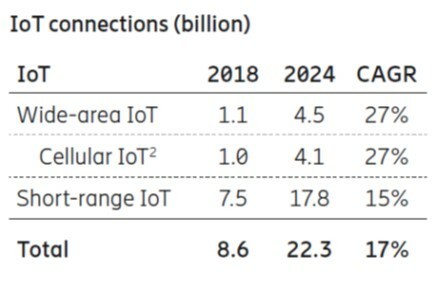 Ericsson’s updated IoT projection shows there are 8.6 billion IoT connection in 2018 but will increase to 22.3 billion by 2024, at a 17% CAGR. Although short-range IoT will continue to be the largest part of the total number of connections, the proportion of wide-range IoT, in particular cellular-based IoT, will grow steadily from 13% in 2018 to over 20% in 2024, at a 27% CAGR.